There is nothing better than ridiculously over sized cookies. Actually that’s a lie – a Nutella smothered, chocolate sprinkled gigantic soft baked cookie is SO much better! 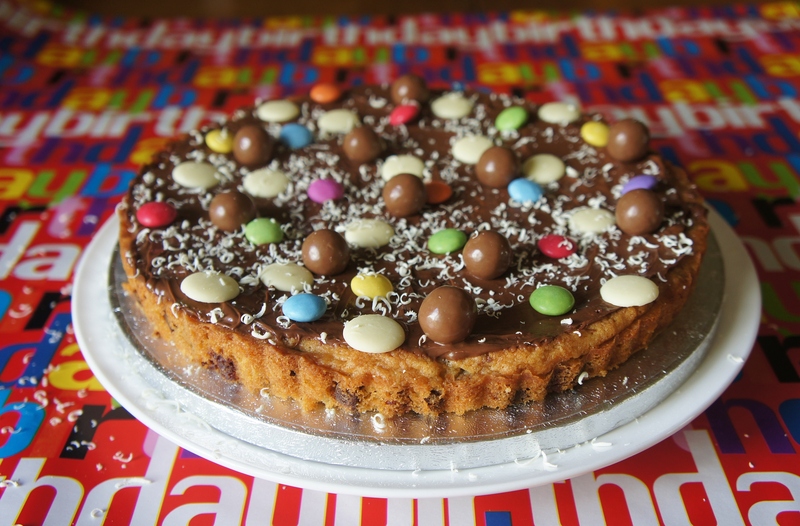 This is by far one of the most tastiest bakes you will ever eat. 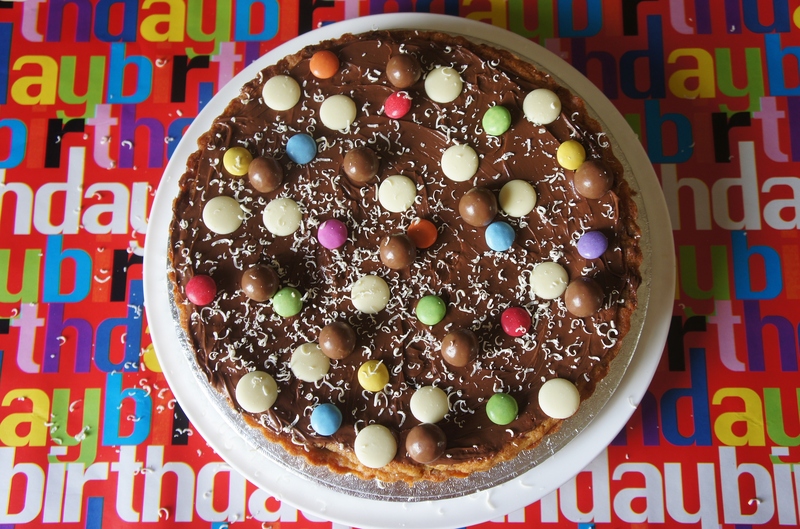 I made this for a special someone’s birthday instead of a cake and it went down a storm. The cookie is soft and chewy in the centre, crunchy on the edges and packed full of slightly melted milk chocolate chunks. I topped mine with Nutella because it is easy to spread, super creamy and just damn right delicious! 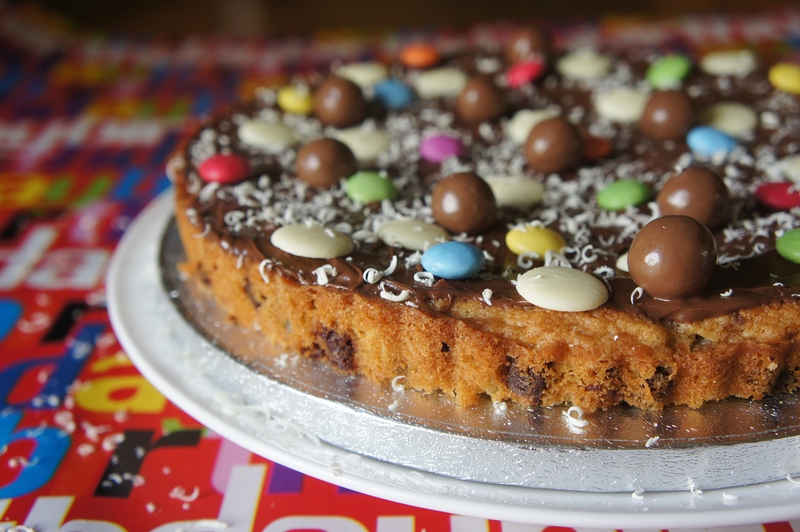 I then dotted some Smarties, Milkybar Buttons and Malteser’s on top and finished my cookie pizza by grating over white chocolate. If my choice of toppings aren’t your kind of thing, then simply bake the choc chip cookie, use it as a base and then add whatever you like. Why not try spreading chocolate ganache or even pipe buttercream on top? Then add whatever toppings you fancy; sweets, chocolate or even Oreo’s!? The best thing about this bake is that the options are endless, so get creative and try out whatever flavours you fancy. P.S – my next cookie pizza will be a Reese’s Peanut Butter explosion!!! To make your cookie base, start by creaming the butter and two sugars together until soft and fluffy. Next, crack in the cold egg and add the vanilla extract and mix together (the mixture is more than likely to curdle at the point, so don’t worry if it does). Now add the flour and the chocolate chunks and fold into the mixture until all ingredients are combined into a dough. Cover the bowl with clingfilm and chill in the fridge for 1-2 hours. 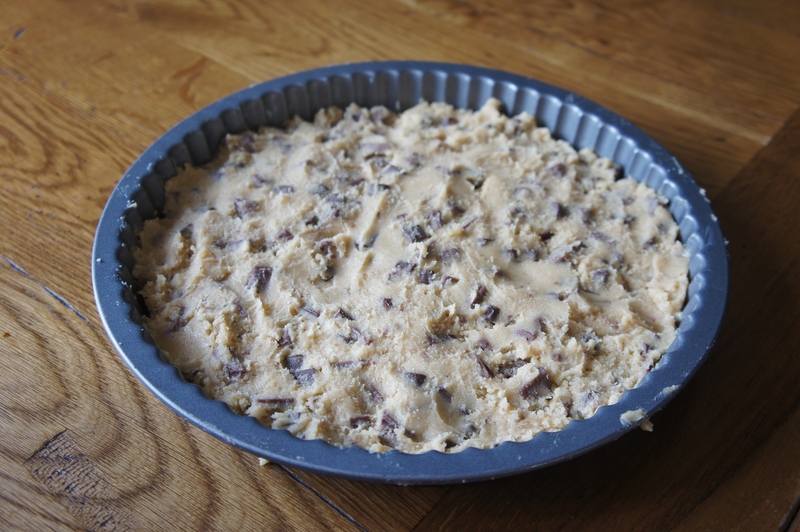 Once chilled, remove from the fridge and press the cookie dough into the baking tin to make an even layer – see below. Bake the cookie for 15 minutes until lightly browned in the middle and slightly crispy on the edges. Leave to cool completely. 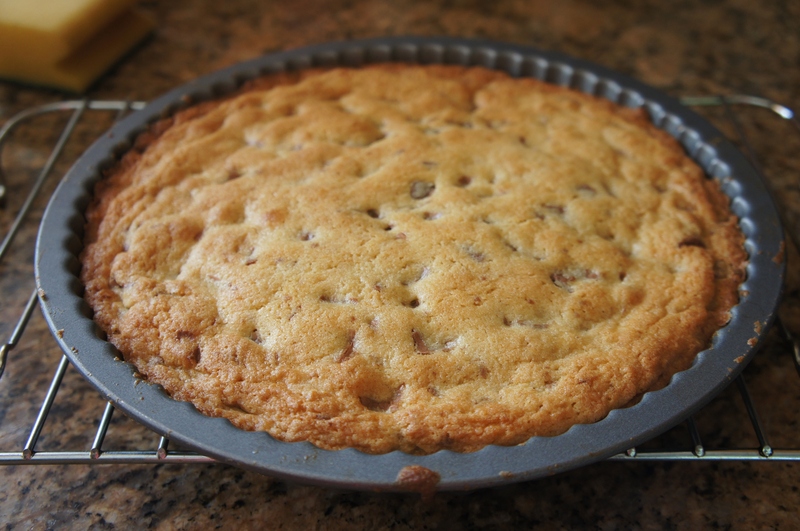 Once the cookie base is cooled, use a spatula to gently remove it from the baking tin and place it on a board or plate (the middle should still be super soft so be extra careful not to break the cookie). Now for the best bit… spread a thick layer of Nutella on top, add your toppings and grate white chocolate all over for the perfect finish!